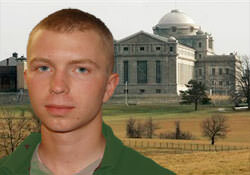 “I was able to tour the [Fort Leavenworth] facility and meet with PFC Manning last week. PFC Manning is now being held in Medium Custody. He is no longer under… harsh pretrial confinement conditions. Unlike at Quantico, PFC Manning’s cell has a large window that provides adequate natural light….PFC Manning is able to have all of his personal items in his cell, which include his clothing, his legal materials, books and letters from family and friends….Each pre-trial area (including PFC Manning’s) has four cells, and each pre-trial detainee is assigned to his own cell. The cells are connected to a shared common area, with a table, a treadmill, a television and a shower area….PFC Manning and his group are taken to the outdoor recreation area [for approximately two hours daily],” explained Coombs on his blog at www.armycourtmartialdefense.info hours ago. US Army intelligence analyst Private First Class Bradley E. Manning, 23-years-old, was arrested in Iraq on May 26, 2010. He still awaits his first public court hearing, now expected to begin in June 2011. Over 4,300 individuals have contributed over $333,000 towards PFC Manning’s legal fees and related public education efforts. 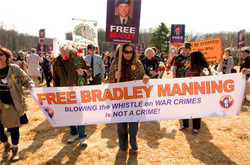 The Bradley Manning Support Network is dedicated to thwarting the military’s attempts to hold a secret court martial, and to eventually winning the freedom of PFC Manning.